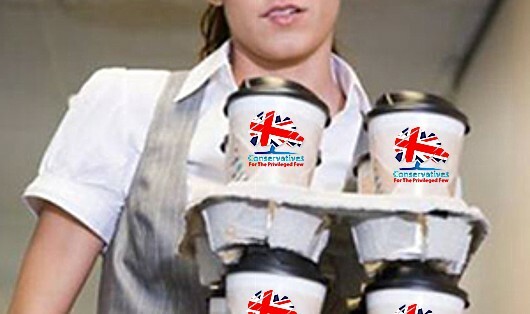 Exploitation: The logo on the cups says, “Conservatives – for the privileged few” – and the intern carrying them isn’t included. “We’re all in it together” are we, George? 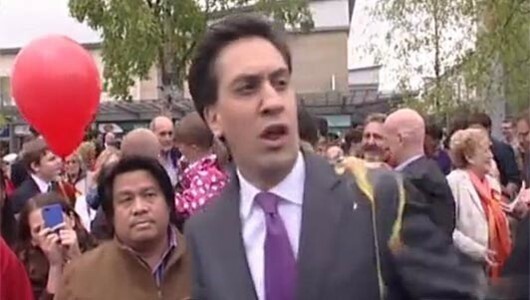 The Conservative Party represents “fairness”, “for hardworking people”, does it, David? It seems not – if we are to judge the Conservative Party by its actions, rather than its words. Yesterday a website focusing on graduate careers blew the full-time whistle on these deceptions, exposing how the Tories have been briefing MPs and candidates on ways to avoid paying the minimum wage by exploiting the perceived differences between volunteers, interns and paid employees. The article on Graduate Fog said a memo circulated to Party members was advising them to start calling their unpaid interns ‘campaign volunteers’, in order to evade “potential hostile questioning” about exploitative business practices. The Conservative Party has denied doing anything wrong by providing advice on ways its members may avoid paying the minimum wage. It would have been better for the Party spokesperson to deny that Conservatives have been wrongly recruiting people as employees – under the umbrella title of ‘interns’ (which means nothing in UK law), while treating them – for payment purposes – as volunteers. But that was impossible because it is exactly what has been happening – as the memo makes clear. Graduate Fog kindly published it for us all to examine. The part that blows the gaff is a “suggested template reply” for “hostile questioning” about the issue of “recruiting unpaid interns”. Clearly, this is what Conservative chiefs want to avoid. Clearly they would not have gone to the effort of circulating a memo if NOBODY was “recruiting unpaid interns”. So there is a clear implication that some Conservative Party MPs and prospective Parliamentary candidates, in fact, have been “recruiting unpaid interns” – and illegally exploiting them by demanding that they carry out the duties of employees. The tone is clear from the get-go: The Conservative Party is running scared. Members are told that people working in an unpaid capacity are no longer to be described as ‘interns’ – they are ‘campaign volunteers’ from now on because, that way, there is no obligation to pay them. 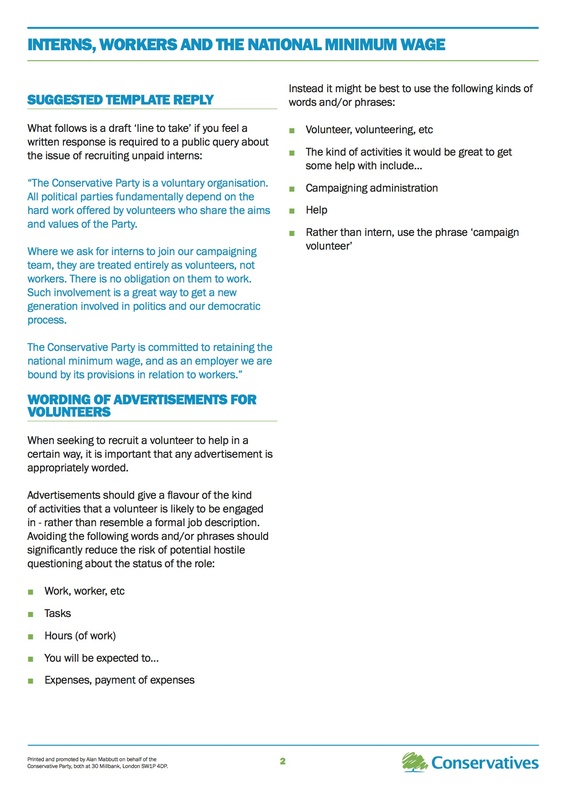 Conservatives are advised not to pay anything at all to these ‘volunteers’ – even expenses – as this could lead to them being classed as ‘workers’ and establishing ‘mutuality of obligation’. 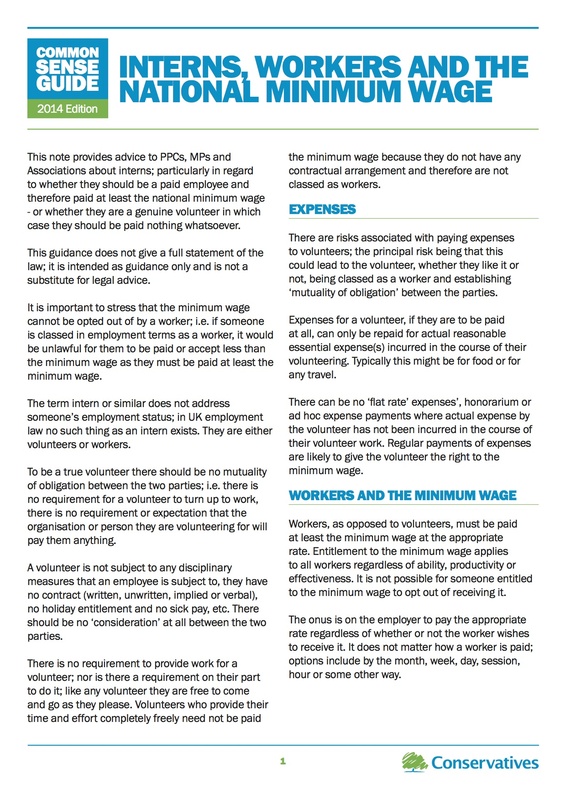 This would be equivalent to payment for services rendered – and the ‘volunteer’ would therefore be classed as a ‘worker’, requiring payment for services rendered, at the minimum wage or higher. From now on, the memo states, recruitment adverts should be “appropriately worded” – meaning there must be nothing resembling a “formal job description”. This means references to “work”, “worker”, “hours” of work, “tasks” the ‘Volunteer’ will be “expected” to perform, and “expenses” are all out. Instead, Party members are advised to use words like “volunteering”, “volunteer”, “campaigning administration”, and “help” – and to describe functions carried out by the “volunteer” as “the kind of activities it would be great to get some help with”. This advice would not be necessary if Conservative Party MPs and prospective Parliamentary candidates had not been illegally “recruiting unpaid interns”. For the interns themselves, this should be terrific news: There can be no requirement for them to turn up to work, and no disciplinary measures may be taken against them if they don’t. They may come and go as they please and do not have to conform to any set working hours. Nor may they be expected to perform any specified duties. If the Tories want people to do that kind of work, they can pay for it like everybody else. … although the minimum wage probably won’t be enough. Like the interns, Vox Political cannot survive on good intentions alone. We need support as well.